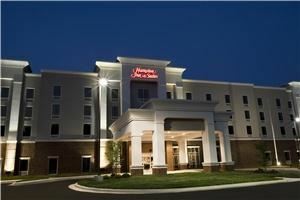 Here at the Hampton Inn & Suites Huntsville Hampton Cove, we're passionate about taking good care of you. That's why we offer a broad range of services and amenities to make your stay exceptional. Whether you're planning a corporate meeting or need accommodations for a family reunion or your child's sporting group, we're delighted to offer you easy planning and booking tools to make the process quick and organized. Our 740 square foot event space offers plenty of flexibility to suit many types of events. From rehearsal dinners to corporate meeting, we are committed to helping make your event a success! Special Features: We are 100% non-smoking facility. We offer complimentary breakfast buffet or On The Run bags, wired/wireless high speed internet access, 24hr business center access, and fitness room or access to Golds Gym.